Synopsis: **UPDATED FOR 2019**From Florida’s Biscayne Bay to the Dry Tortugas, a series of small islands known today as the Florida Keys stretch across approximately 180 miles of ocean. For thousands of years, the islands were only accessible by water. 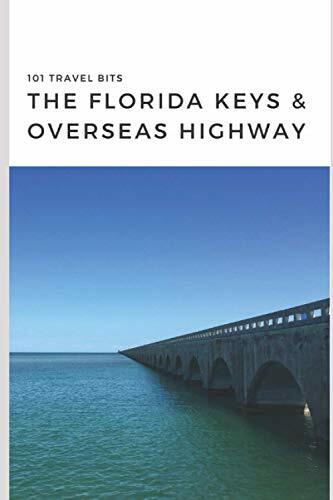 In 1928, the Overseas Highway opened the Keys to vehicular traffic. Today, the Overseas Highway connects the mainland of the United States to Key West, crossing over 113 miles of bridges and islands in one of the world’s most scenic roads. ***Travel Bits™ are not your typical guidebooks. In fact, they aren’t guidebooks at all!Each collection of Travel Bits consists of 101 “bits” of information about one of the great places to visit in the world. This could be a “bit” of history, a “bit” of information on a tourist attraction, or a “bit” of something else interesting about the location.A Travel Bits collection is not intended to be a guidebook to any particular location. You will not find the maps or pictures you would expect in a guidebook in any Travel Bits collection. No Travel Bits collection contains any pictures. Instead, each book gives you information a typical guidebook ignores: history, fun facts and interesting sights along the way.This isn’t to say that there are no pictures involved in a Travel Bits collection. Each Travel Bits collection is optimized for reading as an e-book. This format makes each Travel Bit interactive, with links to official websites and other information where it is appropriate. Thus, instead of raising the cost of the book to include pictures, we take advantage of the Internet’s enormous wealth of information to take you to where the pictures already exist.In case it isn’t obvious, because of the interactive nature of e-books, we highly recommend reading the Travel Bits collections using an e-book reader, as the print versions do not have these interactive features.Thank you, and please enjoy this entry in the Travel Bits series!